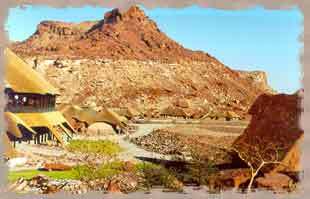 Twyfelfontein Lodge is located in Twyfelfontein area, a very vulnerable and delicate ecosystem, is renowned for some of the best examples of Bushman paintings and rock engravings in Southern Africa. Interesting rock formations and the remainder of prehistoric volcanic action can be seen among the most prominent geographic features including the Organ Pipes, Burnt Mountain, Dorros Crater and the Petrified Forest. 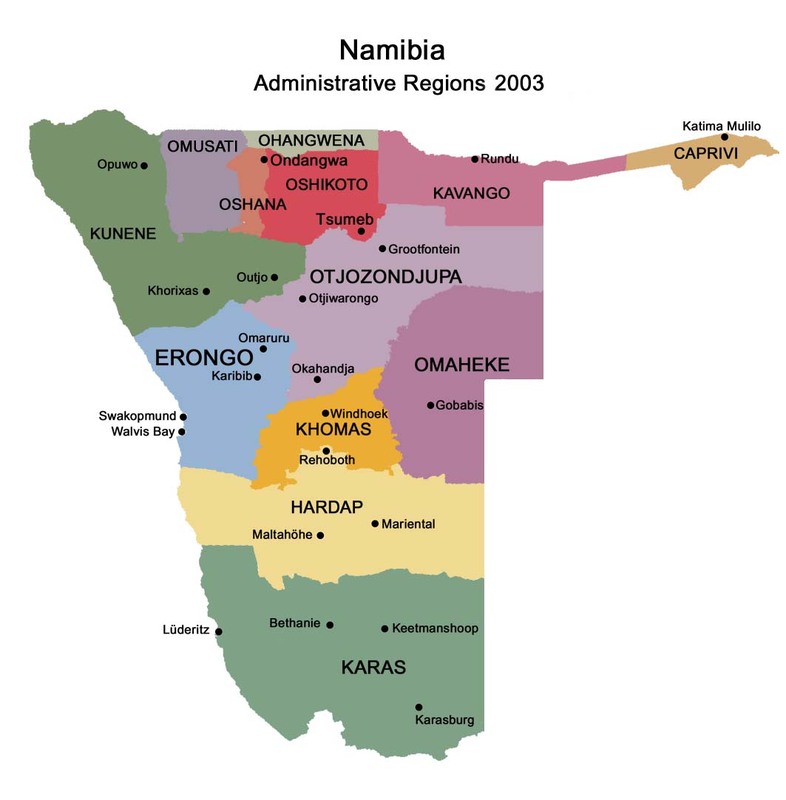 The fauna and flora of Damaraland is typical of the pro-Namib region and plant species include the magnificent Welwitschia, Moringa and a variety of the Commiphora species. The desert adapted elephant, rhinoceros, giraffe, springbok, endemic Damara chat and ostrich are some of the wildlife which can be found living in total harmony with the community and the communal farming activities of the Uibasen Twyfelfontein Conservancy. Twyfelfontein Lodge is situated in the heart of the Twyfelfontein Uibasen Conservancy. In construction utmost care was taken to reduce the visual impact on the environment and to blend into the mountainside with the use of thatch roofs, natural stone and paint colours toning in with the surrounding rock formations. Day excursions from Twyfelfontein Lodge may include hot air balloon trips, flights over the area by light aircraft, nature walks, horse riding and/or guided safaris into the surrounding wilderness areas. 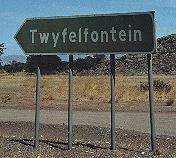 Directions: The Twyfelfontein Country Lodge is located approximately 100 km west of the small town of Khorixas and is accessible along the district road C 39 before joining route 3254 which has indicators to the Twyfelfontein Country Lodge. 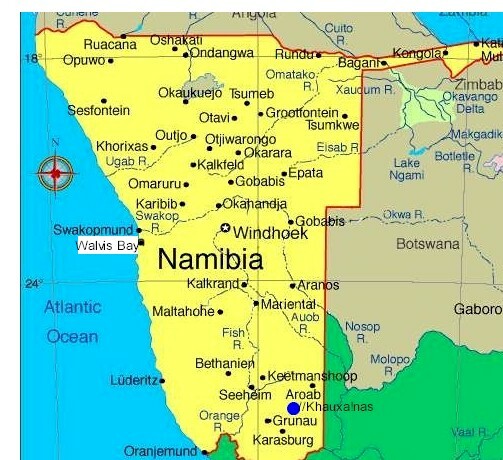 Member of Hospitality Association of Namibia, 56 en-suite double rooms, 1 VIP room, reception, lounge, curio shop, open dining room, bar and swimming pool. Sightseeing flights to Kaokoland, Doros Crater and Skeleton Coast are available on request. 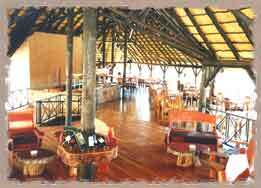 The Lodge was officially opened in July 2000 by Prime Minister Hage Geingob. Co-ordinates for the lodge's 2,2 km gravel airstrip are S 20.34 E 14.22. 1. Twyfelfontein, Burnt Mountain, duration: +- 3 hours. 2. Nature drive, duration: +- 3 hours. 3. Sunset excursion. Sunset excursion follows nature drive. 5. Scenic flights with Cessna 210. Details on request. * Booking fee is applicable. Transfers from/to airstrip are free of charge. Special meals can be booked in advance. Rates are subject to change without prior notice should tax be increased or Government levies introduced. Rates include Value Added Tax, dinner and breakfast. Petrol and diesel are available at the lodge at market related prices.